On Jan. 20, Mexican children dipped their hands into pails of soil to check the moisture level. They tapped the soil into seed trays and then pressed in the seeds of their choice – cabbage, peppers or flowers. Over the next few weeks, the children will gather in a greenhouse next to their Mexicali neighborhood to witness the miracle of germination. The children also witnessed the building of a new bridge between California and Baja California that will give Mexican youth access to proven, hands-on educational experiences from the University of California Division of Agriculture and Natural Resources (UC ANR). Over the last 100 years, the UC ANR 4-H program has taught legions of California children about food, agriculture, leadership and community service using learn-by-doing practices. In January, UC ANR vice president Glenda Humiston traveled to Mexicali to sign a memorandum of understanding with the Baja California Secretary of Agriculture, Manuel Vallodolid Seamanduras, to offer that expertise to youth south of the border. 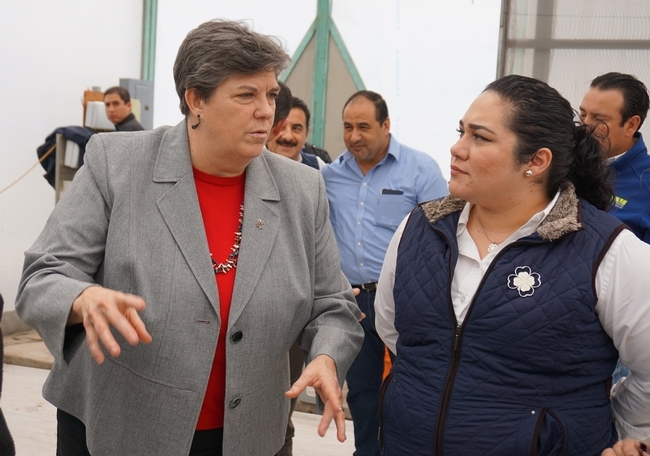 A member of the Baja California state legislature, María Trinidad Vaca Chacón, far right, talked with UC vice president Glenda Humiston before the ceremony. “I want my district to be a model for other communities in the state,” Vaca Chacón said. 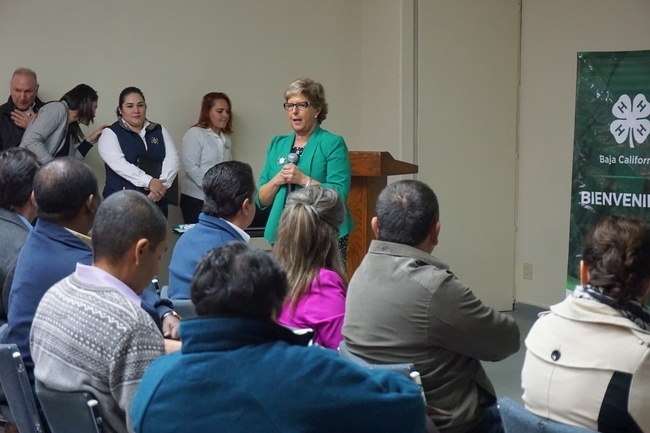 Seamanduras leads SEFOA in Baja, Mexico, an organization like California's Department of Food and Agriculture with facilities in Ejido Sinaloa, a small, humble neighborhood in Mexicali. 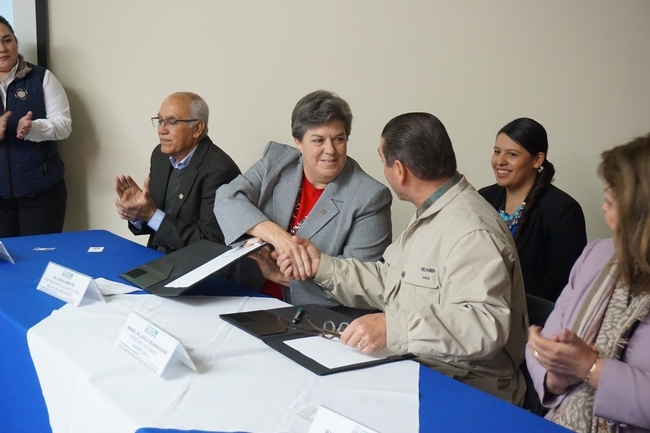 At the ceremony marking the signing of an agreement between UC ANR 4-H and SEFOA, Seamanduras likened the pact to a marriage. “This is a perfect marriage,” Seamanduras said. “This has produced 30 fruits that are not yet mature. 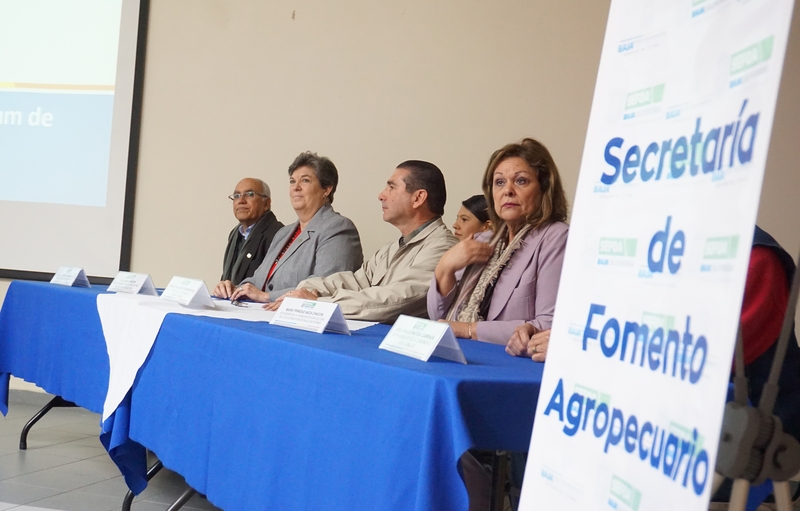 But this fruit is going to feed your community.” The fruit Seamanduras referred to were the children in 4-H.
Glenda Humiston, center, and Manuel Vallodolid Seamanduras, right, sign the memorandum of understanding. José Enrique Partida Lizarraga is one of the people ready to take up the reins. His grandson was among the thirty 8- and 9-year-old founding members of the 4-H Baja California club. Humiston, who credits 4-H with enabling her to be the first in her family to attend college, also spoke to the children gathered at a signing ceremony. “We're excited to share the 4-H experience with you,” she said. Today, projects in new technologies – like drones and rocketry – join more traditional projects – like cooking, sewing, animal husbandry and farming – to give youth channels to explore a wide variety of options and interests. “We are looking into expanding to community colleges and offering education for future entrepreneurs or youth interested in skilled trades,” Humiston said. Before stepping off the stage, Humiston lead the children in reciting the 4-H Pledge. “I'm looking forward to coming down here and seeing 300 or even 400 4-H members next year,” Humiston said. Michelle Dojaquez, right, program chief in for the Baja California Ag Department and coordinator of the new club in Mexico, chats with Glenda Humiston. 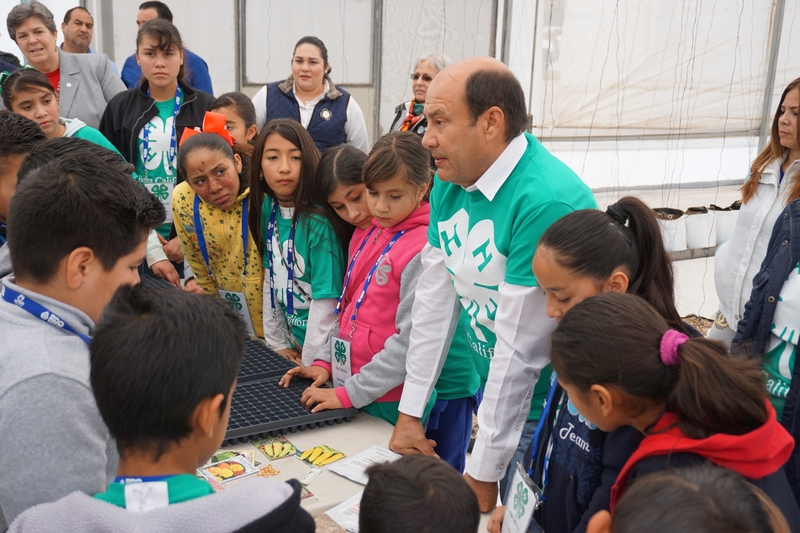 The establishment of a club like 4-H in Mexico is the fulfillment of a life's dream for Claudia Diaz Carrasco, 4-H Youth Development advisor for UC Cooperative Extension in Riverside and San Bernardino counties. A native of Mexico City, Diaz Carrasco came to the U.S. to complete a master's degree in international agriculture. She saw kids in green shirts at a state 4-H Round Up that were learning about food security. She intended to return to Mexico to share her new passion with her native community, but got a job with the University of California, where she is serving communities in Southern California that are nearly half Latino, many of Mexican descent. Helping launch 4-H in Mexico, she said, felt like her own personal mission accomplished. 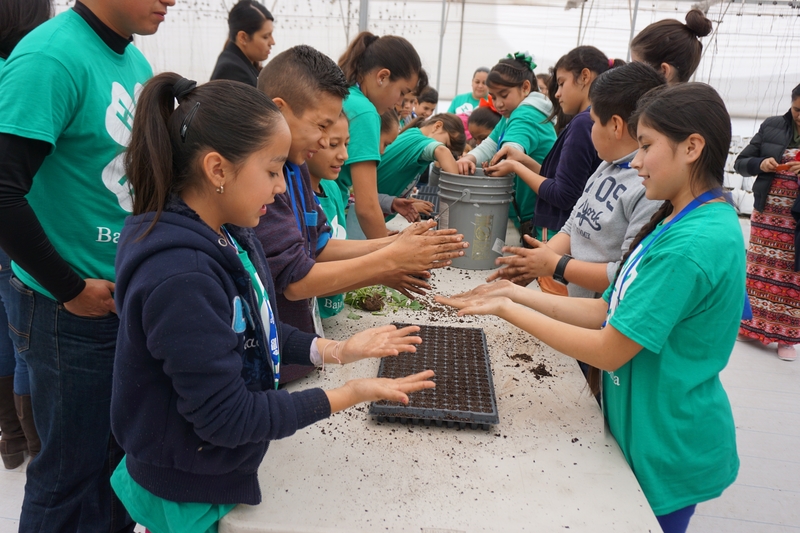 Mexican children get their hands dirty while learning about food and agriculture.